FoxPDF PST to PDF Converter, EML to PDF Converter, Convert EML to PDF, EML to PDF, Outlook to PDF, Eml to PDF, MSG to PDF, PST to PDF etc. 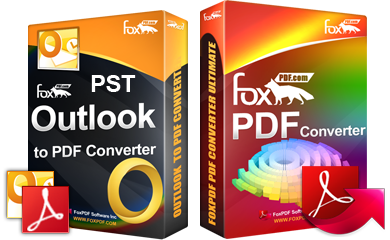 FoxPDF PST to PDF Converter let you batch convert Outlook Email (Eml, MSG, PST) into vector PDF files, quick and easily. The best Outlook (PST) to PDF Conversion Available. Easily convert your Microsoft Outlook (Eml, MSG, PST etc) files into PDF documents with no hassles involved. You can convert Word, Excel, PowerPoint, Outlook (Eml, Msg, Pst) etc 500+ file format to PDF. Why Choose FoxPDF PST to PDF Converter?
. 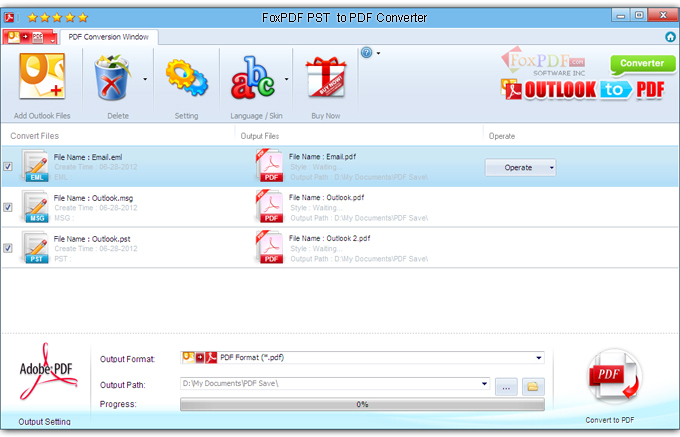 FoxPDF PST to PDF Converter supports a wide variety of versions of Outlook (Eml, MSG, PST) files. Step 2: Run FoxPDF PST to PDF converter, then add PST files to converting panel. Step 4: After all PowerPoint file you want to convert has been added to the PST to PDF converter, Click the CONVERT button to start converting. That’s all, it's very easy for you to convert PST files to PDF with FoxPDF PST to PDF Converter. Why you need to convert EML to PDF? Microsoft Outlook is the email client included with the Microsoft Office suite. It is designed to operate as an independent personal information manager, as an Internet mail client, or in conjunction with the Microsoft Exchange Server for group scheduling, email, and task management. It manages email, calendars, contacts, tasks, to-do lists, and documents or files on the hard drive. Outlook helps you communicate through email, phone support, and group scheduling capabilities. Outlook also helps you share information by means of public folders, forms, and Internet connectivity. However PDF is de facto the standard for the document interchange over the Internet. 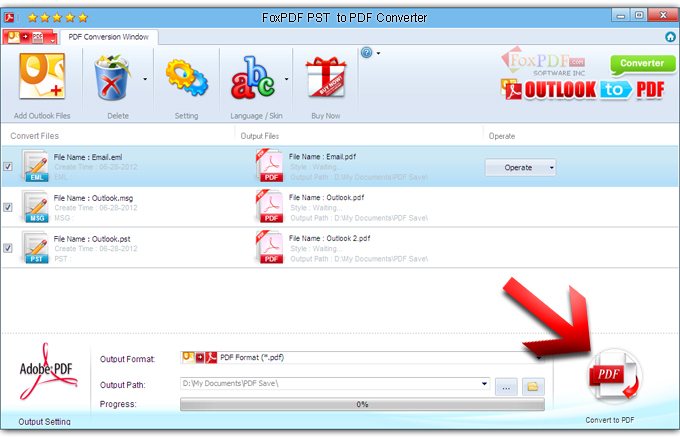 If you need to convert your PST to PDF on the desktop, you can use FoxPDF PST to PDF Converter. Microsoft Outlook is the email client included with the Microsoft Office suite. It is designed to operate as an independent personal information manager, as an Internet mail client, or in conjunction with the Microsoft Exchange Server for group scheduling, email, and task management. It manages email, calendars, contacts, tasks, to-do lists, and documents or files on the hard drive. Outlook helps you communicate through email, phone support, and group scheduling capabilities. Outlook also helps you share information by means of public folders, forms, and Internet connectivity. Outlook juggles scheduling, groupware, personal information (contacts, tasks), email, and documents all in one place, and allows you to create and view information using a consistent interface. You can find information easily with Windows shortcuts, which let you navigate to any private, public, or file system folders. Outlook Journal helps you find a document based on creation date and name. Outlook lets you arrange information any way you want to see it. You can apply any of Outlook's standard five views to information, or you can customize a view using the Field Chooser and Group By Box features.